The aortic arch, arch of the aorta, or transverse aortic arch (English: /eɪˈɔːrtɪk/) is the part of the aorta between the ascending and descending aorta. The arch travels backward, so that it ultimately runs to the left of the trachea. The aortic arch has three branches, the brachiocephalic trunk, left common carotid artery, and left subclavian artery. From its branches, the upper body, arms, head and neck. As a part of the aorta, the entire body, with exception of the respiratory zone of the lung and the heart. 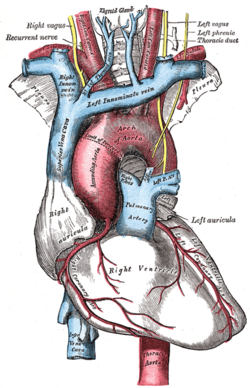 At the cellular level, the aorta and the aortic arch are composed of three layers: The tunica intima, which surrounds the lumen and is composed of simple squamal epithelial cells; the tunica media, composed of smooth cell muscles and elastic fibers; and, the tunica adventitia, composed of loose collagen fibers. Innervated by barometric nerve terminals, the aortic arch is responsible for sensing changes in the dilation of the vascular walls, inducing changes in heart rate to compensate for changes in blood pressure. The aortic arch has three branches. The first, and largest, branch of the arch of the aorta is the brachiocephalic trunk, which is to the right and slightly anterior to the other two branches and originates behind the manubrium of the sternum. Next, the left common carotid artery originates from the aortic arch to the left of the brachiocephalic trunk, then ascends along the left side of the trachea and through the superior mediastinum. Finally, the left subclavian artery comes off of the aortic arch to the left of the left common carotid artery and ascends, with the left common carotid, through the superior mediastinum and along the left side of the trachea. :216 An anatomical variation is that the left vertebral artery can arise from the aortic arch instead of the left subclavian artery. Coming out of the heart, the thoracic aorta has a maximum diameter of 40 mm at the root. By the time it becomes the ascending aorta, the diameter should be < 35–38 mm, and 30 mm at the arch. The diameter of the descending aorta should not exceed 25 mm. 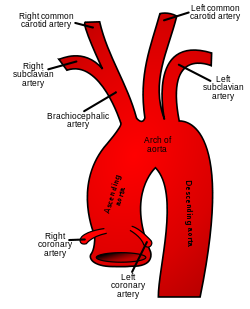 The aortic arch is the connection between the ascending and descending aorta, and its central part is formed by the left 4th aortic arch during early development. The ductus arteriosus connects to the lower part of the arch in foetal life. This allows blood from the right ventricle to mostly bypass the pulmonary vessels as they develop. The final section of the aortic arch is known as the isthmus of aorta. This is so called because it is a narrowing (isthmus) of the aorta as a result of decreased blood flow when in foetal life. As the left ventricle of the heart increases in size throughout life, the narrowing eventually dilates to become a normal size. If this does not occur, this can result in coarctation of the aorta. The ductus arteriosus connects to the final section of the arch in foetal life and the ligamentum arteriosum when the ductus arteriosus regresses. There are three common variations in how arteries branch from the aortic arch. In about 75% of individuals, the branching is "normal", as described above. In some individuals the left common carotid artery originates from the brachiocephalic artery rather than the aortic arch. In others, the brachiocephalic artery and left common carotid artery share an origin. This variant is found in approximately a 20% of the population. 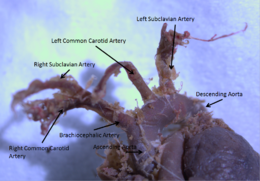 In a third variant, the brachiocephalic artery splits into three arteries: the left common carotid artery, the right common carotid artery and the right subclavian artery; this variant is found in an estimated 7% of individuals. The arch of aorta can be seen here, with the lungs to either side and emerging from the heart, below. A branch of the vagus nerve, the recurrent laryngeal nerve, passes underneath the arch of aorta. The nerve is seen here. ^ "The Cardiovascular System (Blood Vessels)". www2.highlands.edu. Retrieved 2017-04-22. ^ webmaster@studentconsult.com. "Printed from STUDENT CONSULT: Berne and Levy Physiology 6E - The Online Medical Library for Students plus USMLE Steps 123 (ver. 2.9)". users.atw.hu. Retrieved 2017-04-22. ^ a b c Kulkarni, Neeta V. (2006). Clinical anatomy for students : problem solving approach. New Delhi: Jaypee Bros. Medical Publishers. p. 211. ISBN 978-8180617348. ^ Singh, Inderbir (2011). Textbook of anatomy (5th ed.). New Delhi: Jaypee Brothers Medical Publishers. p. 465. ISBN 978-9350253823. ^ Acad Radiol. 2008 Jul;15(7):827-34 doi:10.1016/j.acra.2008.02.001. PMID 18572117. PMC 2577848. ^ a b Rubin, Raphael; Strayer, David S., eds. (2008). Rubin's Pathology: clinicopathologic foundations of medicine (5th ed.). Philadelphia [u.a. ]: Wolters Kluwer/Lippincott Williams & Wilkins. p. 442. ISBN 978-0-7817-9516-6. ^ David P. Naidich; W. Richard Webb; Nester L. Muller; Ioannis Vlahos; Glenn A. Krinsky, eds. (2007). Computed tomography and magnetic resonance of the thorax (4th ed.). Philadelphia: Wolters Kluwer/Lippincott Williams & Wilkins. p. 100. ISBN 978-0-7817-5765-2. ^ a b Spacek, Miloslav; Veselka, Josef (2012). "Letters to Editor Bovine arch". Archives of Medical Science. 1 (1): 166–167. doi:10.5114/aoms.2012.27297. ISSN 1734-1922. PMC 3309453. PMID 22457691. Wikimedia Commons has media related to Arcus aortae.